Hope, Naomi, and Claira Dannefer are blessing people in need by giving through the Samaritan's Purse Christmas catalog. Claira, right, collected and sold scrap metal to raise money for projects such as cleft lip and cataract surgeries, water filters, and dairy goats. The Dannefer family is always looking for creative ways to give to others—at home and around the world—and the Samaritan's Purse gift catalog provides a great starting point. As many children eagerly prepare their wish lists for what they want for Christmas, a family in Kansas is deciding what they want to give. Two years ago, Eric and Melissa Dannefer of Abilene showed their three young daughters the Samaritan’s Purse gift catalog and asked each of them to choose one item to help needy families overseas. Hope, left, made bracelets to raise money to provide hot meals for children in poverty. Naomi, then 12, and Claira, 11, picked farm animals. Seven-year-old Hope selected hot meals for kids. She was excited that for just $7 she could feed one child for a week. “I really wanted to help feed kids that were hungry,” said Hope. But she quickly determined that feeding only one child wasn’t enough. She wanted to bless a lot more girls and boys, so the second-grader proposed making something that she could sell to raise money to provide additional hot meals. The volume of orders surpassed Hope’s expectations when the family posted information about the project on Facebook. With each bracelet requiring 42 safety pins and 9-12 beads per pin, they practically bought out the craft supplies stores in town and ordered the rest online. Their goal was to have the bracelets completed in time for Christmas that year. Hope’s mom, dad, and sisters all pitched in to fulfill the requests. During Thanksgiving weekend the project expanded 80 miles away to her grandparents’ farm in Rossville, where Daryl and Jan Dannefer also joined in the fun. Within two months, Hope had raised enough funds to feed hot meals to 62 children for one week, or one child for over a year. Inspired by the success of her younger sister’s project, Claira set out to support a Samaritan’s Purse program last year. “My friends and I thought it was really cool that Hope’s bracelets made an impact and blessed a lot of kids, so we wanted to do something too,” she said. One of her friends was born with a cleft lip and had reparative surgery when she was a baby. Claira wanted to raise funds—about $200 to $300—to change the life of a child overseas who had no means to receive cleft lip or palate surgery. Claira collected and sold scrap metal and recyclable materials in order to purchase gifts in the Samaritan’s Purse Christmas catalog. A garage sale or recycling aluminum cans for donations were among the initial ideas. Then, Claira was visiting her grandparents one afternoon and watched Daryl pile a load of scrap iron from the farm onto the back of his pickup truck. Claira wasn’t dissuaded. And when her grandfather realized that she was serious, he began to embrace the fundraising idea too. Daryl hauled his truckload of scrap to Topeka and set aside the $15 sale for Claira’s project. Then he turned to Facebook and asked people in Rossville and surrounding communities to contact him if they had iron, aluminum, or copper material they wanted to get rid of. “That’s when it kind of snowballed,” he chuckled. For the next nine months Daryl got dozens of requests from people, sometimes 30 or 40 miles away, who wanted to help Claira. Some didn’t have any items to haul away; they just wanted to give a monetary donation. “I told our garbage man in Rossville about the project. When he came to pick up my trash, he would drop off several pieces of scrap iron for Claira,” Daryl said. Claira and her dad loading scrap metal. Dismantled farm equipment, appliances, fence wire, copper pipes, bicycles, and car parts were among the trash-to-treasure items. A friend of Daryl’s donated an old truck. On weekends Claira and her sisters occasionally went with their grandfather to pick up scrap or take a load to be recycled. They also collected material from residents in Abilene. Daryl estimates that he hauled 25 to 30 truckloads of material away last year, generating a total of $1,346. 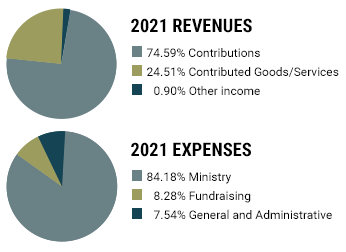 The Dannefers used the majority of those funds to give to several items in the Samaritan’s Purse catalog—cleft lip repairs, cataract surgeries, water filters, dairy goats, and warm blankets. Claira also paid the shipping costs for the Operation Christmas Child shoeboxes collected by their church, and she contributed the remainder to help people in their local community. That giving spirit was inspired in part by a missions trip the Dannefers took to Mexico in 2013. Their church team helped build a house for a poor family that had no electricity or indoor plumbing. The Dannefer daughters and grandfather Daryl. “One of our goals in raising our children is to have them see that the world is bigger than their own [environment]. We are trying to encourage them to use what they have to give to others,” Melissa said. “That was our hope for the gift catalog—to come up with a list of things that somebody else didn’t have or couldn’t have because of where they lived in the world,” she said. With Christmas just around the corner, Hope already knows what item to put on her giving list for Samaritan’s Purse this year—basketballs and sports gear.